Examples, videos, worksheets, solution, and activities to help Algebra 1 students learn how to solve systems of linear equations graphically. 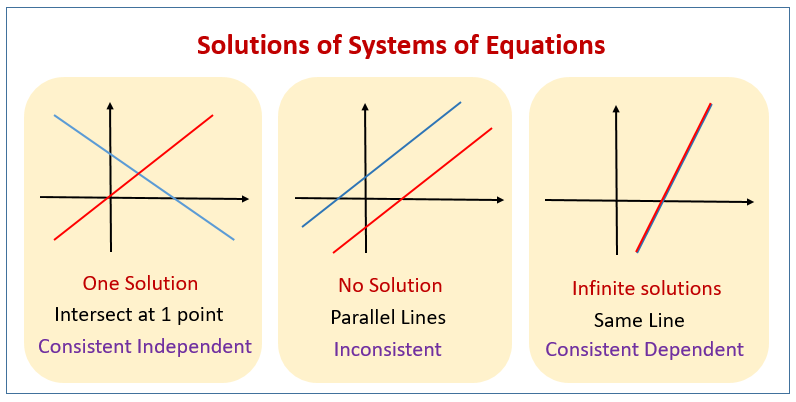 The following diagrams show the three types of solutions that can be obtained from a system of linear equations. Scroll down the page for more examples and solutions on graphing systems of linear equations. How to solve a system of linear equations by graphing? The first step is to graph each of the given equations, then find the point of intersection of the two lines, which is the solution to the system of equations. If the two lines are parallel, then the solution to the system is the null set. If the two given equations represent the same line, then the solution to the system is the equation of that line. Some examples on solving systems of equations graphically.